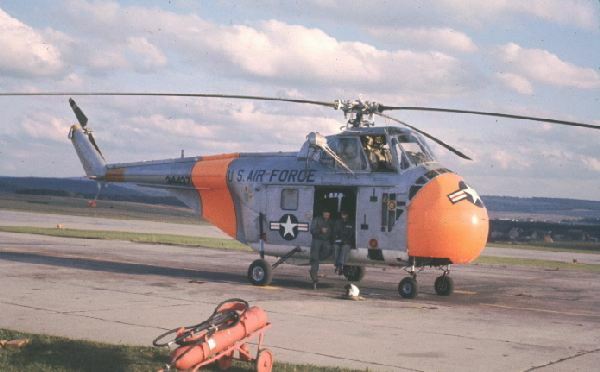 In the early 60's the 38th Tac Missile Wing acquired this H-19 helicopter for missile site support. Two of the pilots were Wayne Arvo and Jay Strayer. On the day these pictures were taken (a particularly nice day in 1961) I was on a day off from my missile duties, and (per usual) I was at the flight line, trying to scrounge an extra flight. (An aside about my flying at Sembach. I was in a missile unit -- first a launch officer at Grunstadt, then duty officer in the command post -- so my flying was of the "proficiency" variety.) During my first year I flew Sembach's "base flight" C-47, including some memorable cross countries --Berlin, Copenhagen, London, etc. But I had flown the T-33 in pilot training, and for the remainder of my tour (a little over two years) I managed to talk my way into being attached for flying to the "simulated missile section" of the 38th Tactical Missile Wing. It transferred to Sembach from Hahn in 1959, and went out of business three years later when the older TM-61C "Matador" missile was deactivated. This small unit -- most folks on Sembach didn't know what they did -- with call sign "Maverick", had specially equipped T-33 jets with the same APW-11 airborne transponder that was the primary guidance system of the "Matador" missiles, then still operational with the 385th Tac Missile Group at Bitburg. After a missile were launched, those missiles would have been directed to an eastern Bloc target by the ground radar weapon controllers of the 601st Tactical Control Group at their lonely hill-top radar sites near the border of East Germany.